Android Marshmallow is still trickling out to devices. The roll-out has been slow, but more and more devices are getting a taste of Marshmallow every day. A leaked document suggests that Samsung will start updating their top devices very soon. 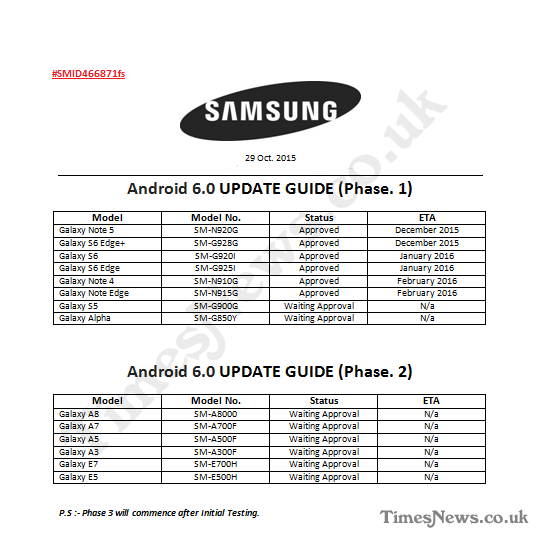 According to the chart, the Samsung Galaxy Note 5 andSamsung Galaxy S6 Edge Plus will get Marshmallow next month. In the following month (January), the Samsung Galaxy S6 and Samsung Galaxy S6 Edge will get the update, followed by the Samsung Galaxy Note 4 and Samsung Galaxy Note Edge in February. TheSamsung Galaxy S5 and Galaxy Alpha are listed in the “Phase 1” roll-out, but still waiting for approval. “Phase 2” of the roll-out includes a bunch of older and less popular devices, like the Galaxy A8, A7, A5, A3, E7, and E5. These devices will likely be looking at Q2 of 2016 before they get updated. The good news is Samsung will be updating their top devices in the next couple of months. We would like to see the Galaxy S6 be included in the first month, but January is better than nothing.